Throughout the first half of the twentieth century Girvan was a popular summer resort for the working people of Glasgow and the industrial towns of the central belt. 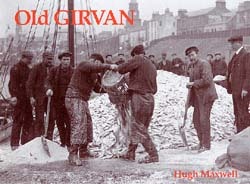 That heyday is recalled in the fifty-two photographs of this book, as well as the town's fishing industry. Several pictures in the collection feature large catches of cod laid out on the quayside and one shows a boat practically capsizing under the weight of a huge tuna caught in the Firth of Clyde – sights not seen for many years. The town's history is beautifully narrated and includes anecdotes such as the time when the lifeboat had to be launched to rescue men on Ailsa Craig from famine, the burning of the McMaster Hall, the blizzard of 1908, victory celebrations after the First World War, and the murder of Alexander Ross. The attractions of past summers are also featured – the Pierrots, the Canadian Cavaliers, the bathing boxes, and the simple pleasure of building castles in the sand.